Home » Certified Products » Building Products » Residential Windows, Doors & Skylights » What makes it ENERGY STAR? Windows, doors and skylights protect you from the elements just like a winter coat. But like a winter coat, you should pick the windows, doors and skylights that make the most sense for your climate. While some windows, doors and skylights are better at keeping you warm, others excel at keeping you cool. The ENERGY STAR Climate Zone Map shows the four climate zones used for windows and skylights: Northern, North-Central, South-Central, and Southern. Geographically speaking, the Northern Zone covers most of the country and the Southern Zone is the smallest, but the North-Central and South-Central Zones cover some major population centers. To find which climate zone includes your home, or for other information on the climate zones, please contact ENERGY STAR for Windows, Doors, and Skylights at windows@energystar.gov. Performance criteria for windows and skylights are based on ratings certified by the National Fenestration Rating Council (NFRC), and vary for each of the climate zones shown in the map above. To find the climate in which you are located, search here. This table, ENERGY STAR Qualification Criteria for Residential Windows and Skylights, provides the qualification criteria for each ENERGY STAR climate zone. ENERGY STAR criteria use U-factor (measured in British thermal units over hours times square-feet times degrees Fahrenheit) and Solar Heat Gain Coefficient (or SHGC, a fraction of incident solar radiation) ratings. The qualification criteria for windows are as follows: In the Northern Zone, there are prescriptive and equivalent energy performance criteria. The prescriptive criteria require a U-factor of 0.27 or less and any SHGC. With the equivalent energy performance criteria, products can be considered certified with the following performance: U-factor of 0.28 if the SHGC is greater than or equal to 0.32; or, U-factor of 0.29 if the SHGC is greater than or equal to 0.37; or, U-factor of 0.30 if the SHGC is greater than or equal to 0.42. All other zones only have prescriptive criteria. In the North-Central Zone, the U-factor requirement is 0.30 or less and the SHGC must be 0.40 or less. The South-Central Zone allows U-factors of 0.30 or below and SHGC ratings of 0.25 or below. Windows qualified in the Southern Zone can have U-factors of 0.40 or less, but the SHGC must be 0.25 or below. The qualification criteria for skylights are prescriptive only and are as follows: In the Northern Zone, skylights must have a U-factor of 0.50 or less and any SHGC. In the North-Central Zone, skylights must have a U-factor of 0.53 or less and an SHGC of 0.35 or less. In the South-Central Zone, skylights must have a U-factor of 0.53 or less and an SHGC of 0.28 or less. In the Southern Zone, skylights must have a U-factor of 0.60 or less and an SHGC of 0.28 or less. Doors are a little different. Many doors don't have any glass (like your front door), but even doors with lots of glass (like a sliding patio door) have lower glass-to-frame ratios than windows or skylights. This means doors can provide more insulation than a window or skylight can. Performance criteria for doors are based on the amount of glass they have (called glazing level) and ratings certified by the National Fenestration Rating Council (NFRC). This table, ENERGY STAR Qualification Criteria for Residential Doors, provides the qualification criteria for each glazing level. Glazing level refers to the amount of glass in the door. An opaque door has no glass. A door that is less than or equal to half-lite is comprised of approximately half glass or less. A door that is greater than half-lite is mostly glass; this category includes fully glazed or full-lite doors such as sliding glass doors. ENERGY STAR criteria use U-factor (measured in British thermal units over hours times square-feet times degrees Fahrenheit) and Solar Heat Gain Coefficient (or SHGC, a fraction of incident solar radiation) ratings. The qualification criteria for doors are as follows: Opaque doors must have a U-factor of 0.17 or less and there is not requirement for SHGC. Less than or equal to half-lite doors must have a U-factor of 0.25 or less and an SHGC of 0.25 or less. Greater than half-lite doors have SHGC criteria that differs by climate zone. 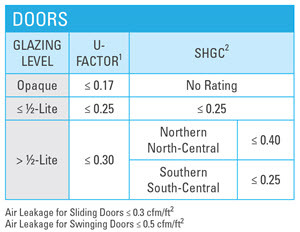 Greater than half-lite doors installed in the Northern or North-Central Climate Zones must have a U-factor of 0.30 or less and an SHGC of 0.40 or less. Greater than half-lite doors installed in the South-Central or Southern Climate Zones must have a U-factor of 0.30 or less and an SHGC of 0.40 or less. 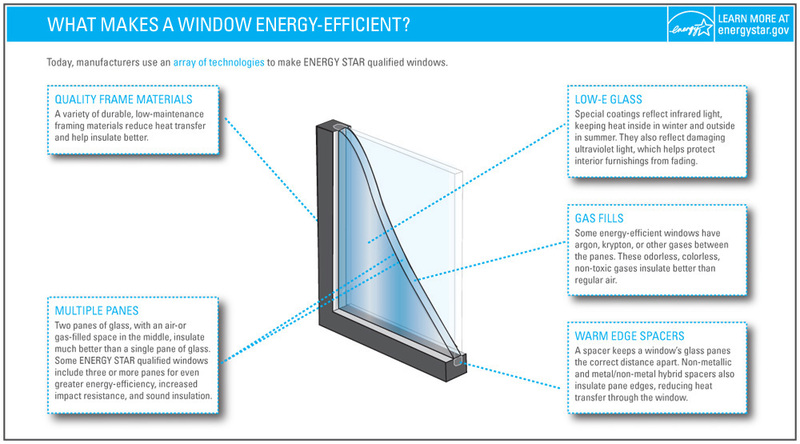 Many ENERGY STAR certified windows, doors and skylights have some or all of the product features detailed below. But these features are not required. Learn more about what makes it ENERGY STAR. Anatomy of an energy-efficient window: Quality Frame Materials: A variety of durable, low-maintenance framing materials reduce heat transfer and help insulate better. Multiple Panes: Two panes of glass, with an air or gas-filled space in the middle, insulate much better than a single pane of glass. Some ENERGY STAR-qualified windows include three or more panes for even greater energy-efficiency, increased impact resistance, and sound insulation. Low-E Glass: Special Coatings reflect infrared light, keeping heat inside in winter and outside in summer. They also reflect damaging ultraviolet light, which helps protect interior furnishings from fading. Gas Fills: Some energy-efficient windows have argon, krypton, or other gases between the panes. These odorless, colorless, non-toxic gases insulate better than regular air. Warm Edge Spacers: A spacer keeps a window's glass panes the correct distance apart. Non-metallic and metal/non-metal hybrid spacers also insulate pane edges, reducing heat tansfer through the window. ENERGY STAR certified windows come in a variety of framing materials. Fiberglass frames are strong, durable, low maintenance, and provide good insulation. Fiberglass frames can be either hollow or filled with foam insulation. Aluminum frames are durable, low maintenance, recyclable, and typically have at least 15% recycled content. Frame design typically includes thermal breaks to reduce conductive heat loss through the metal. Wood frames are strong, provide good insulation, and are generally favored in historical neighborhoods. The exterior surfaces of many wood windows are clad (or covered) with aluminum or vinyl to reduce maintenance. Combination frames use different materials separately throughout the frame and sash to provide optimal performance. For example, the exterior half of a frame could be vinyl while the interior half could be wood. Composite frames are made of various materials that have been blended together through manufacturing processes to create durable, low maintenance, well-insulated windows. To learn more about efficient window technologies, visit the Efficient Windows Collaborative. 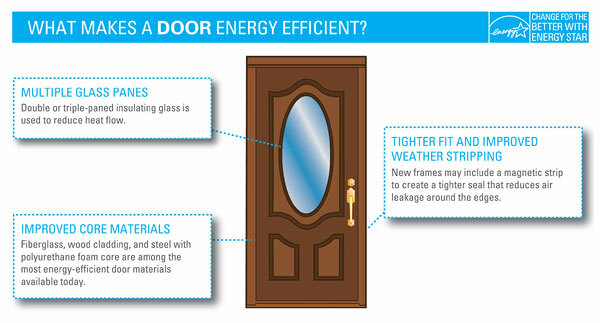 What Makes a Door Energy Efficient? Multiple Glass Panes: Double or triple-paned insulating glass is used to reduce heat flow. Tighter Fit and Improved Weather Stripping: New frames may include a magnetic strip to create a tighter seal that reduces air leakage around the edges. Improved Core Materials: Fiberglass, wood cladding, and steel with polyurethane foam core are among the most energy-efficient door materials available today. 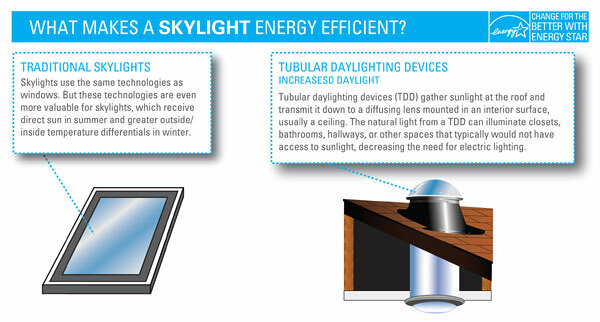 What Makes a Skylight Energy Efficient? Traditional Skylights: Skylights use the same technologies as windows. But these technologies are even more valuable for skylights, which receive direct sun in summer and greater outside/inside temperature differentials in winter. Tubular Daylighting Devices: Increased Daylight. Tubular Daylighting Devices (TDD) gather sunlight at the roof and transmit it down to a diffusing lens mounted in an interior surface, usually a ceiling. The natural light from a TDD can illuminate closets, bathrooms, hallways, or other spaces that typically would not have direct access to sunlight, decreasing the need for electrical lighting.